In the context of cricket, the swing of the ball is defined as the ball which curves in or away in the air before or after hitting the pitch. 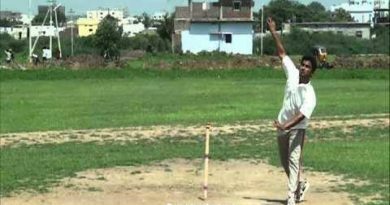 Unlike in seaming deliveries where seam of the ball takes place when the ball actually hits the pitch or moves off the pitch, but here in swing bowling the swing of the ball happens in the air before or after hitting the pitch. Any international standard cricket ball can be divided into three parts. When the ball is new generally the swing of the ball moving into the batsman or away from the batsman depends on shiny leather part, seam position, how do you hold a ball, seamy part, position of the wrist and presence of moisture in the pitch. But where as when the ball is old or odd one or especially when the ball starts reverse swinging the swing of the ball moving into the batsman or away from the batsman generally depends on shiny leather part, climatic conditions, nature of the pitch but will not depend on seam position, seamy part of the ball, position of the wrist. To swing the ball into the batsman or away from the batsman gripping or holding the ball is key factor. So to swing the ball into the batsman the ball has to be gripped in such a manner, the fingers index and middle are slightly separated from each other and facing slightly towards slip region in such a way that the position of seam of the ball has to face towards the batsman or leg slip region. And the middle finger is rested on right part of the seam completely from tip of the finger to the other end with the joints. Now the index finger has to be flat on left part of the seam but not rested completely. The index finger facing towards slip region is slightly rested (flat) on both leather part and left part of the seam. Then the thumb is nicely rested below down with the seam and the remaining fingers are kept down on the right leather part of the ball. At the end of the day to swing the ball into the batsman you need to hold the ball with both the fingers index and middle facing slightly towards slip region and position of seam of the ball facing towards the batsman or leg slip region. 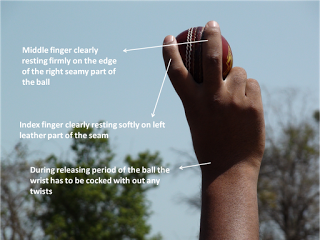 The position of seam of the ball has to face towards the batsman or leg slip region with the help of index and middle fingers, but not with the support from the wrist. The wrist has to be steady, straight and firm with the fore arm and only the index and middle fingers should be adjusted so that the seamy part of the ball has to face towards the batsman or leg slip region. Now the middle finger should play a complete major role in swinging the ball or dragging down or pulling down the seam towards the batsman with the help of steady and firm wrist. Here the index finger which is kept flat on left seamy part of the ball plays a minor role in swinging the ball into the batsman. Unlike in seam bowling where both the index and middle fingers play a major role in seaming the ball into the batsman but where as in Inswing bowling only the middle finger plays a major role in swinging the ball into the batsman. When the ball is new, to which ever the position of seam of the ball faces it swings in that direction only (Generally). 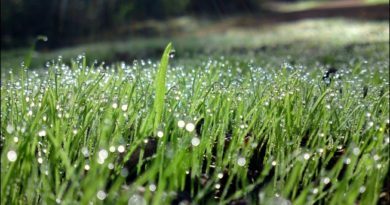 The above conditions for swing bowling doesn’t mean that you don’t get seam in swing bowling, you will get seaming deliveries by above conditions too, but to get nice genuine swing bowling the above conditions are necessary. 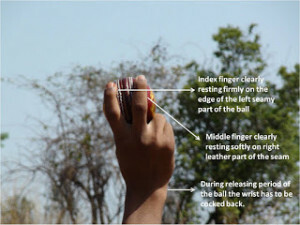 So to swing the ball away from the batsman the ball has to be gripped in such a manner, the fingers index and middle are slightly separated from each other and facing slightly towards the batsman or leg slip region in such a way that the position of seam of the ball has to face towards 1st slip or 2nd slip region. And the index finger is rested on left part of the seam completely from tip of the finger to the other end with the joints. Now the middle finger has to be flat on right part of the seam but not rested completely. The middle finger facing towards batsman or leg slip region is slightly rested (flat) on both leather part and right part of the seam. Then the thumb is nicely rested below down with the seam and the remaining fingers are kept down on the right leather part of the ball. At the end of the day to swing the ball away from the batsman you need to hold the ball with both the fingers index and middle facing slightly towards the batsman or leg slip region and position of seam of the ball facing towards 1st slip or 2nd slip region. The position of seam of the ball has to face towards 1st slip or 2nd slip region with the help of index and middle fingers, but not with the support from the wrist. The wrist has to be steady, straight and firm with the fore arm and only the index and middle fingers should be adjusted so that the seamy part of the ball has to face towards 1st slip or 2nd slip region. Now the index finger should play a complete major role in swinging the ball or dragging down or pulling down the seam away from the batsman or towards 1st slip or 2nd slip region with the help of steady and firm wrist. Unlike in seam bowling where both the index and middle fingers play a major role in seaming the ball away from the batsman but where as in Outswing bowling only the index finger plays a major role in swinging the ball away from the batsman.